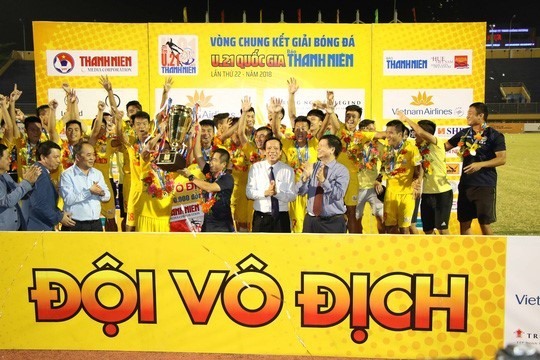 Hà Nội were crowned National U21 Champions on Saturday at the Tự Do Stadium in Huế. The team from the capital defeated rivals Becamex Bình Dương 1-0 to claim the title after attacking from the whistle. The strategy was rewarded with a goal from Nguyễn Thành Chung of Hà Nội in the 10th minute, which proved to be the decider. Chung was named man of the match, and said he was ecstatic to hear he had also been voted player of the tournament. “I will try my best at the upcoming National Sports Games to win a plave on the national U22 side. I feel like I only gave 85 per cent during this tournament, so I need to do more,” he said. Top scorer went to striker Phan Thanh Hậu of HAGL with three goals. Hà Nội has number of young footballers playing for the national U19, U20 and U21 teams. Hà Nội were awarded US$10,800, while runners-up Bình Dương got $5,200.